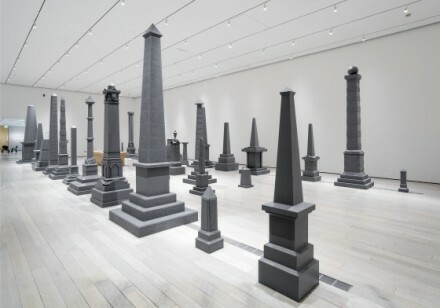 After its entry to LACMA’s permanent collection in 2013, Sam Durant’s Proposal for White and Indian Dead Monument Transpositions, Washington D.C. is on view for the first time at its permanent home. 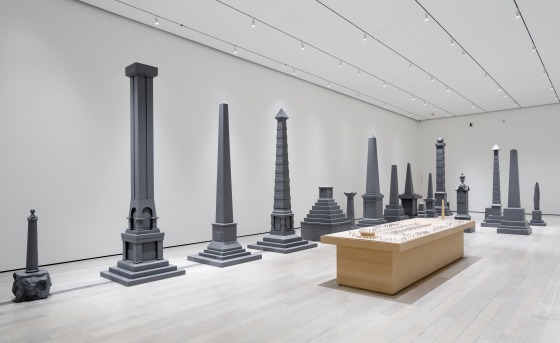 Durant has always been strongly tied to the historical and social dynamics in America, and the artist’s ongoing work with the flux of history and spatial politics perhaps reached an apex with this installation. At core of Durant’s proposal is the relocation of thirty monuments erected between 19th and 20th centuries across the country to commemorate those who were killed during American conflicts, starting with Columbus’ discovery of the New World until the late 1800s. 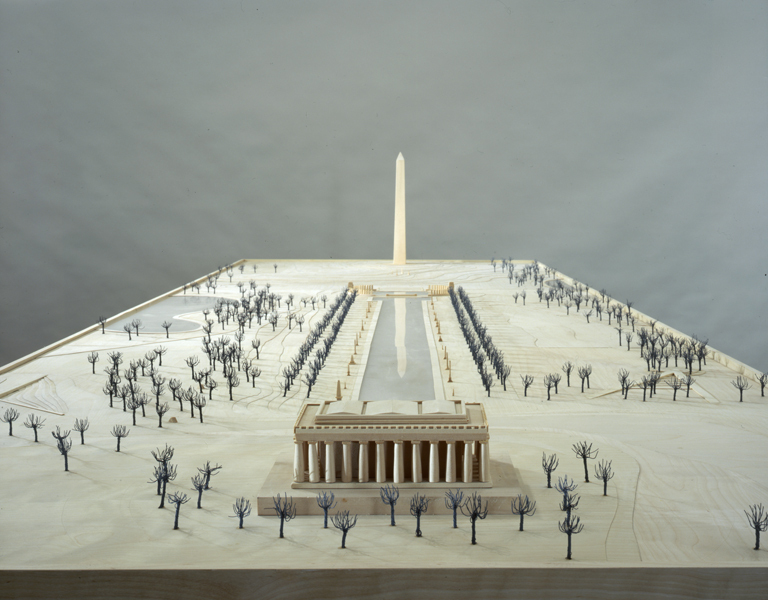 The large-scale installation, consisting of thirty scaled-down replicas of these monuments, as well as a table size plan of the suggested replacement around the National Mall in Washington D.C, invites viewers to contemplate the limitations of historical information and how, either written or told, history can be imposed on already established hierarchies. The formations of collective phenomenons, from one sided interpretations of retold histories to the impacts of racial and national identities, have always sat at the crux of Durant’s interests as an artist. Supplemented by a thorough historical research, the artist’s proposal here underlines a strong interest in the winding history of America as the “New World” an understandably loaded term that perpetuates a Eurocentric approach to history. 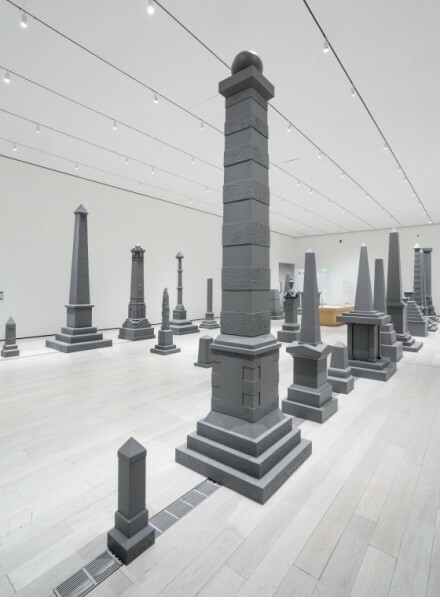 In his argument, Durant emphasizes that a monument erected by a white settler to effectively memorialize victims of American colonization underscores the inherent discrimination at play in historical narratives. 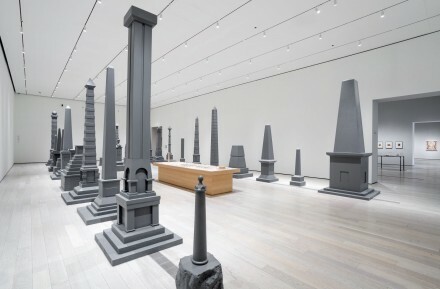 In turn, Durant also utilizes the distinctly misguided term “Indian” throughout, mirroring the colonization of language and identity as perpetuated throughout these monuments. Focusing on the limited perspective and subjective use of facts in this discourse, the artist aims to reconstruct a neutral and non-hierarchal reading of the past. These monuments, eternalizing the formation of America, only serve as a modest guide of the real events. The rare examples among these monuments, such as the one in Gnadenhutten, Ohio, are also dedicated to Native Americans as well, but, lacking an objective perspective, solely celebrate those, who were regarded as “friendly” or “safe” allies that had mostly converted to Christianity and had assimilated into the European way of life. The separation between the two parties of dead is physically reflected in Durant’s plan for relocation of the monuments, proposing the monuments dedicated to white settlers to be positioned on both sides of the pool between the Lincoln Memorial and the Washington Monument. The lawn across from the Washington Monument would host the memorials for the Native Americans, eventually materializing the distinction between two groups as well as reflecting the unequal distribution of freedom and historical presence. 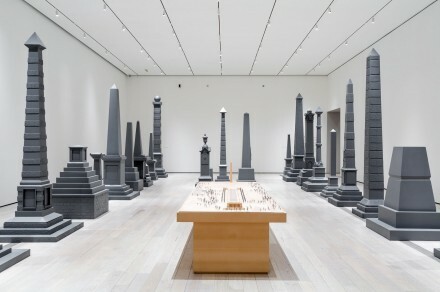 Including a discriminatory action in his work, Durant keeps the historical potency of these objects alive, continuing to embed an awareness of social and historical conflict even as he brings due recognition to certain areas of deficiency in the American narrative. Sam Durant: Proposal for White and Indian Dead Monument Transpositions, Washington D.C. is on view at Los Angeles County Museum of Art through November 30, 2014. 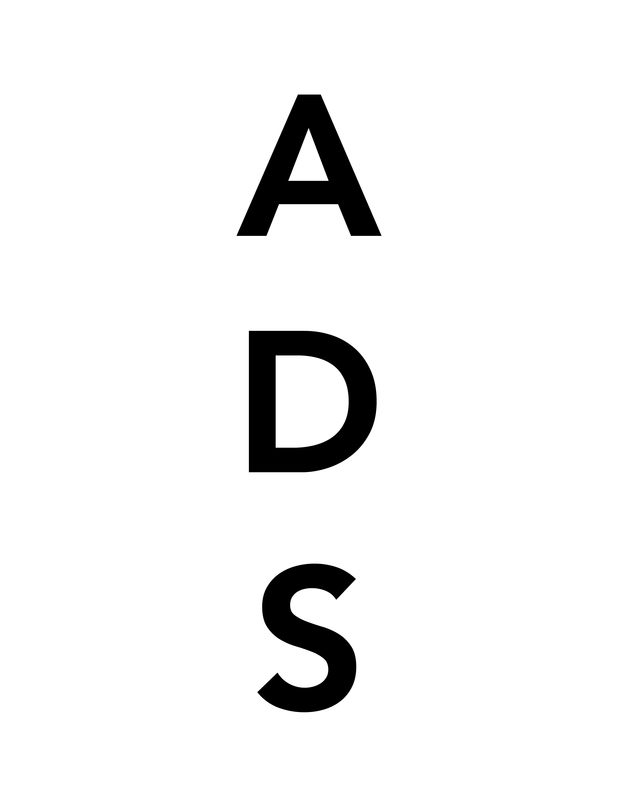 This entry was posted on Tuesday, November 18th, 2014 at 12:00 am	and is filed under Art News. You can follow any responses to this entry through the RSS 2.0 feed. You can leave a response, or trackback from your own site.